One thing I want to do for my children is put them in touch with beautiful thoughts and ideas, to teach them to appreciate the gifts of others, and to be open to expressing their own ideas in creative ways. It is an area I need to work on. 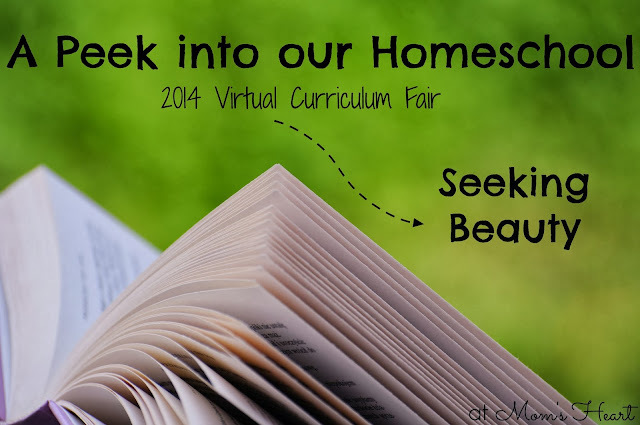 This is the final week of the Virtual Curriculum Fair and we are discussing the topic of Seeking Beauty: the Arts and Everything that Brings Beauty to Our World. We are hit and miss with art lately, although the boys do like it. I use a variety of resources to try to include art appreciation and expression. When I wrote about Charlotte Mason Preschool, the Fine Arts for the Preschooler post discussed how I cover music and art in the preschool years. It is about exposure and exploration at this age. Now that Elliott is a bit more disciplined and enjoys exploring new things, I am really trying to go beyond exploration and explore new materials and techniques. While I'm not consistent, I am working on this. We reviewed ARTistic Pursuits and loved it. It is a quality program, and I would like to continue using it through our homeschooling career. Deep Space Sparkle - This art teacher's website is full of fun and colorful and engaging lessons. I use it at home like in this snowman art project and at co-op. Speaking of co-op, we do take some art classes outside of the home. Both boys take art at co-op and they both enjoy it. This relieves my guilt that we don't do it as much at home. Then the local art museum offers a variety of art classes, one of which is completely free. Every weekend they have a 2 hour class that is half art and half "movement" with the local performing arts center. We finally went to our first class, and the boys liked it. It's quite a drive for us every weekend, but we're thinking perhaps once a month. I've read rave reviews, and I found a fantastic deal so I grabbed it up. Elliott really likes these when he uses them on his own terms. They're great to keep on our main shelf to grab for independent drawing. I think poetry falls under literature, but also falls into this area of beauty. I always start with Mother Goose in preschool. After that we move on to a variety of poetry. Sometimes it's fun and silly poetry and sometimes we find other activities like combining the handicraft of origami with a poetry book. We're currently reading through A Child's Garden of Verses by Robert Louis Stevenson, and then AA Milne's poetry books are next! I have several other anthologies in the house, just waiting their turn. I want to be more consistent about handicrafts in our homeschool, but in reality we just don't do them the way we should. I still have soap carving on our to-do list, but we haven't tried it yet. Elliott would like origami (or at least the art of paper air crafts) but I'm thinking that should be a daddy-son project. The one thing we do consistently are life skills, and the one they particularly enjoy is learning to use tools. We always allow the boys to use the tools, when appropriate, as they are helping around the house or repairing things. They also still enjoy the free Home Depot workshops, as I've mentioned many times before. 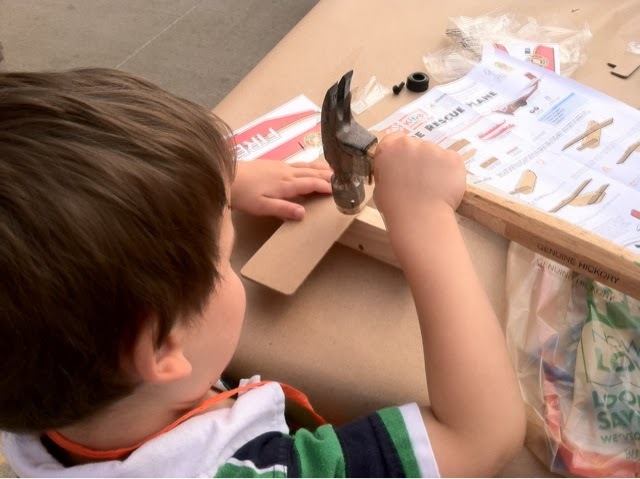 I think learning to use tools is a valuable skill for home repairs and such, but eventually I would like the boys to explore woodworking on a more advanced level, if they are interested. So that is how I am attempting to bring beauty into our home and allow my children to express their own beauty. What about you? Do you find it easy to incorporate fine arts and handicrafts? What activities do your children enjoy? Hit or miss here too, but I figure it is better than nothing, right? My boys would love woodworking too! Have you see artforkidshub.com? It's a great site in which the teacher does tutorials with his young son. My boys set up the iPad and go do his videos for a couple of hours. We like Draw Write Now as well. I loved your poetry suggestions, I'd like to do more with that. Wow, that Art For Kids looks fun! My boys would enjoy it too!